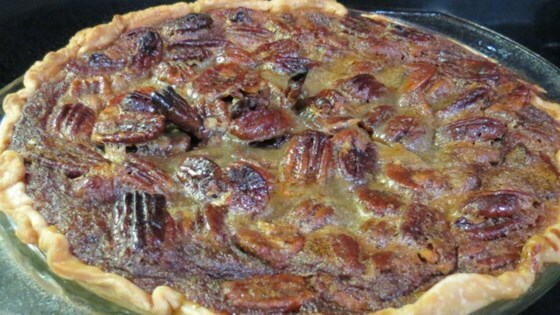 "Not as sweet as just a pecan pie, this combination pie is an excellent dessert for your holiday meals and special occasions." Place rack in upper third of oven. Preheat oven to 425 degrees F (220 degrees C). To Make Pumpkin Layer: In a medium bowl combine pumpkin puree, 2 tablespoons brown sugar, 1 egg, sour cream, cinnamon, and nutmeg. Stir until thoroughly combined. Spread mixture into pie shell. To Make Pecan Layer: In a medium bowl, combine corn syrup, 1/2 cup brown sugar, 3 eggs, butter, vanilla, lemon rind, lemon juice, and salt. Mix well, then stir in pecans. Carefully spoon mixture over pumpkin layer. Bake in preheated oven for 20 minutes, then reduce heat to 350 degrees F (175 degrees C). Bake an additional 20 to 30 minutes. The filling will puff slightly, but the center will not be completely set. Allow to set for at least an hour before serving. Serve warm or at room temperature. My husband always request a pecan pie for Thanksgiving, but my favorite has always been pumpkin pie. It was great to make a recipe that combined the two. It was very easy and delicious! I've tried several recipes for pecan pumpkin pie but this is the best and easiest to make, everyone will be asking for you to make it again! Everyone raved about this pie during Thanksgiving and I now need to make it again for Christmas. So easy and so delicious! This pie was excellent! Made it for Christmas and it disapeared quick. Next time I'll bake 2. Thanks for sharing this recipe.